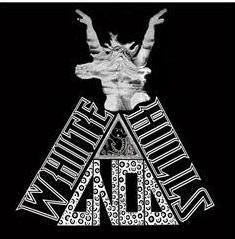 This is a five track collaboration with the NYC band, White Hills. I think this is a limited edition CD-R of like 100 copies. While both bands have been known to freakout at the highest level, this material is very much more laid back, spacey ambient psychedelic drone stuff. The CD is 5 tracks in 49 minutes. It begins with a short track called Belonging with slowly gets louder and louder as the buzz saw distorted synths layer on it. Hard Bitter Reality is 11 minutes and begins more ambient with piano, various noises and slowly, very slowly drones along staying very spaced out. Some tabla drums enter in later and changes the feel of the drone. Subordinate Contact is also deep out in space and features primitive drumming deep below the drones. Some different types of spaced out synths appear on this track. Deeply spaced.. The title track, Aquarian Downer takes up the next 11 minutes of your bodily existence. This track starts really quiet as if you are slowly creeping up on a strange band rehearsing in dungeon and making far out music from another world. This is my favourite track. The CD ends with When you are Old, which is a very slowly evolving drone track that gets more and more heavy as the sound frequencies are slowly taken up around you until you feel like you are going to dissolve. This is stuff best heard while stoned.